LIFE HACKS #1268 BEACH HACK: BUY A DIAPER AND INSERT YOUR V - ProudMummy.com the Web's Community for Mums. 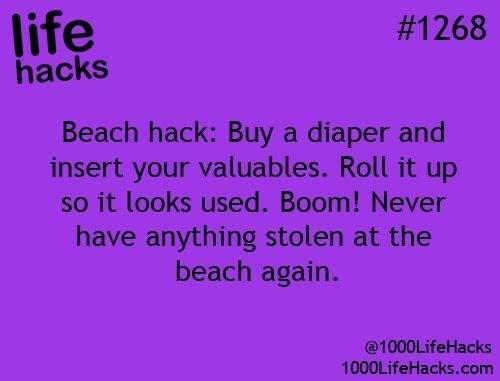 LIFE HACKS #1268 BEACH HACK: BUY A DIAPER AND INSERT YOUR VALUABLES. ROLL IT UP SO IT LOOKS USED. BOOM! NEVER HAVE ANYTHING STOLEN AT THE BEACH AGAIN. It seems a bad idea, what if someone helpfull decides to put it in the bin for you!